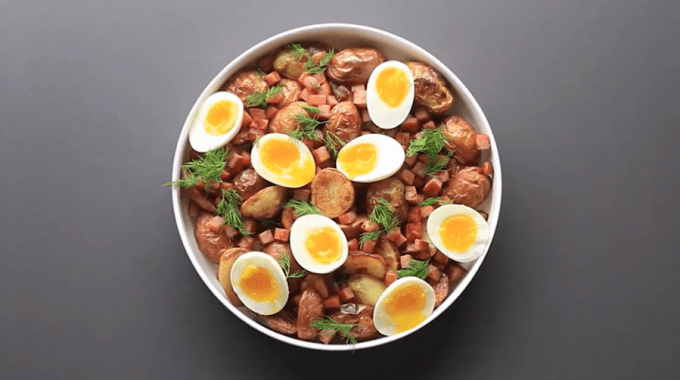 Ham and Egg Potato Salad | This post was sponsored by Smithfield. All opinions expressed on my site are my own. I have a love/hate relationship with summer. I basically love it in the morning and evening and hate it in the middle of the day. So yeah, I only come out when the sun is barely in the sky. My favorite time of day in the summer is late in the day when it’s still light out and the sun is just beginning to set. 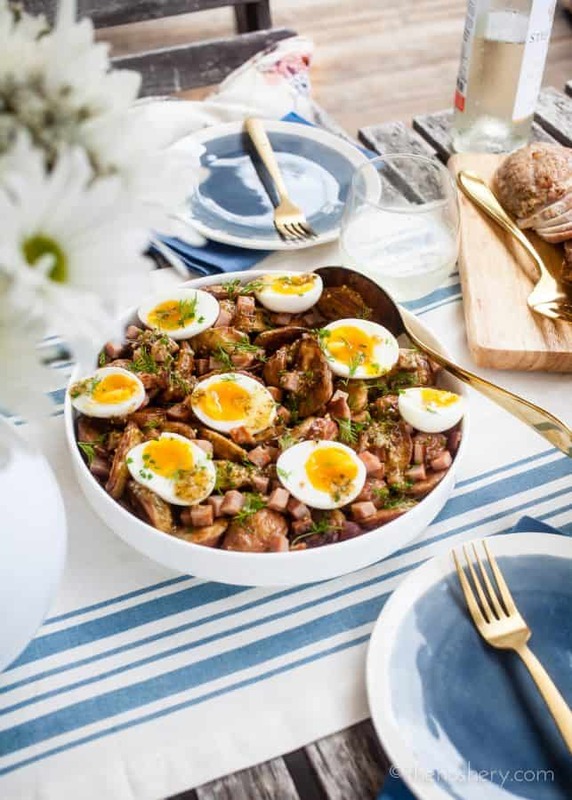 Let’s talk about this potato salad. 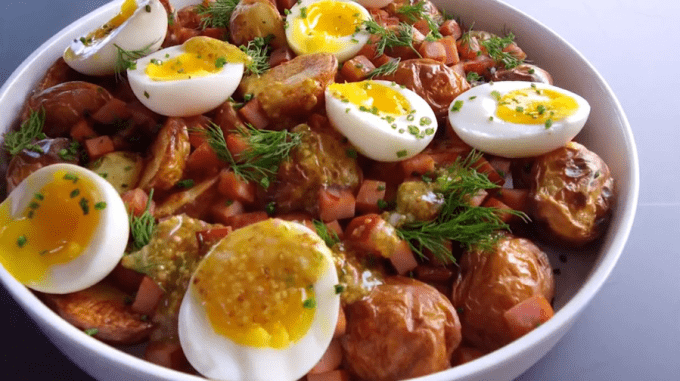 It’s not your typical “boiled potato and mayonnaise” potato salad. I decided to doll this one up a bit. First of all, the dish would not be the same without the Smithfield Anytime Favorites Hickory Smoked Ham incorporated throughout. By roasting the potatoes instead of boiling them, it gives them a little more texture. I then added some soft-boiled eggs and a whole grain mustard vinaigrette. Finally, I topped it off with some fresh dill and chives. If you prefer hard-boiled eggs, by all means, go for it! But, I promise you that soft-boiled eggs, with creamy egg yolks, is the way to go. 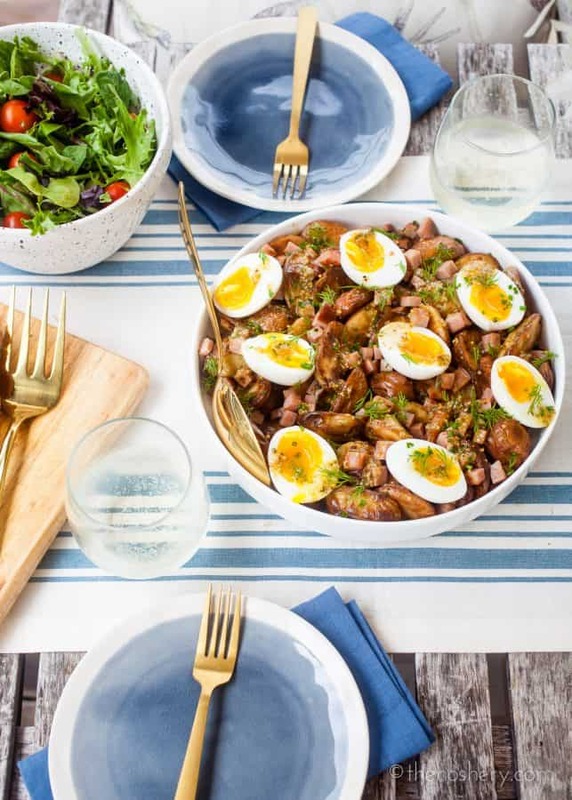 Smithfield Ham is the hero of this salad and the dish would not be the same without it. You don’t need much to make an outdoor romantic dinner for two. The sun setting on a warm summer day creates the needed ambiance. We normally save romantic dinners for two for special occasions or weekends but, occasionally, it’s nice to toss a little surprise romance in on a weeknight. The key is to keep it simple and use things you have around the house. 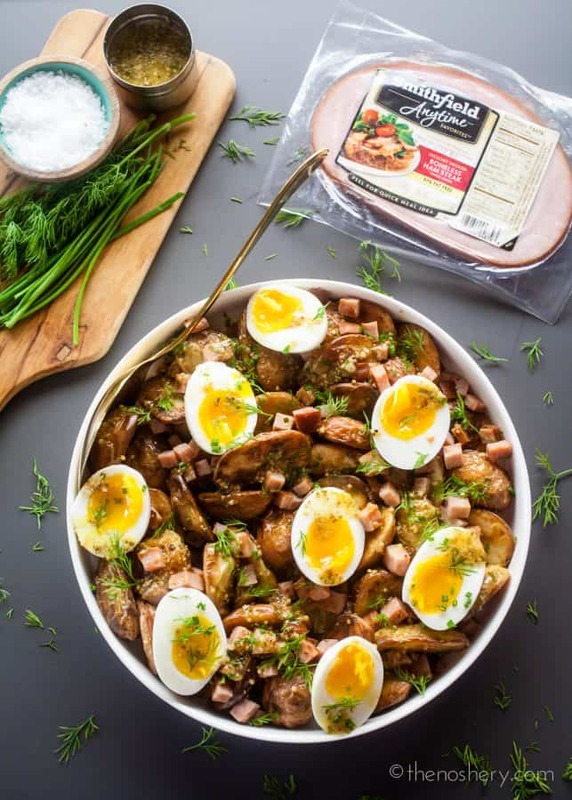 Make dinner easy with Smithfield Ham, a side salad, and this roasted potato salad with Smithfield Anytime Favorites Boneless Ham Steaks. 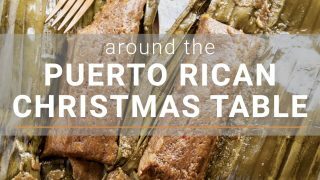 Serve it with your favorite chilled white wine or a sparkling white grape juice. Candles | If bugs are an issue, use citronella candles. Candles are more romantic than lights, and they don’t attract bugs. Flowers | Grab a pre-arranged bouquet from the grocery store and drop them in a jar or pitcher. Shade | Before the sun sets, a little shade will help keep things cool. Real dishes and utensils | Make the extra effort to use glass dishware and real utensils. Table linens | A simple runner and some cloth napkins add a little snap to your table setting. If you don’t table lines don’t stress it, the point is to spend some special time with your loved one. Wine or sparkling grape juice | A refreshing chilled glass of wine or sparkling grape juice is a perfect complement to a romantic dinner. Since I live in such a small space, I like to refer to our outdoor patio set as our “formal dining.” Yes, it may be a dining area where we grill and use paper plates on occasion, but with just a few changes it can become the most relaxing and intimate setting. Summertime is full of kids’ activities and vacations. The goal here is to enjoy a mini-escape from the “busy-ness” of summer. Take just a little time to sit and relax with your love and enjoy a satisfying meal on real plates with flowers and candles. Nothing says summer like grilling and outdoor fun. And there is no better way to make your summer dinners delicious than with the mouthwatering flavor of slow-smoked, hand-crafted Smithfield Anytime Favorites Ham. What are some of your favorite ways to spend summer with your loved ones? 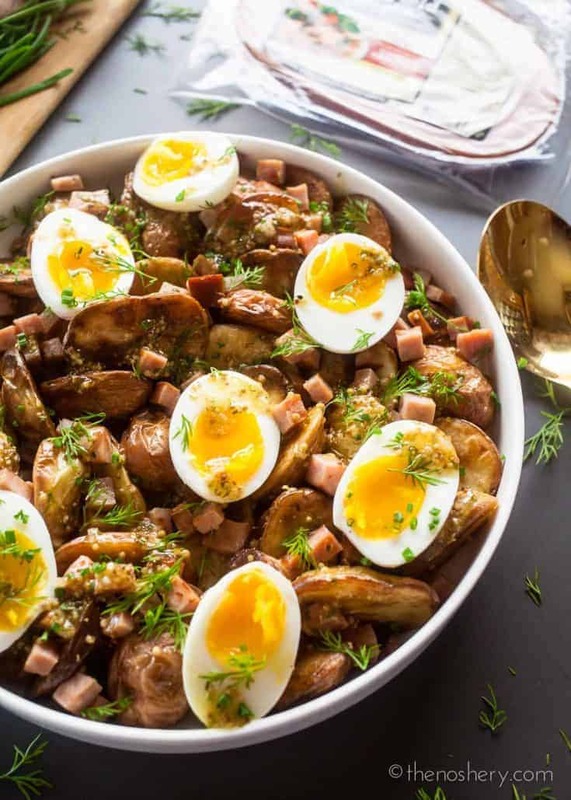 This isn’t your typical “boiled potato and mayonnaise” potato salad. 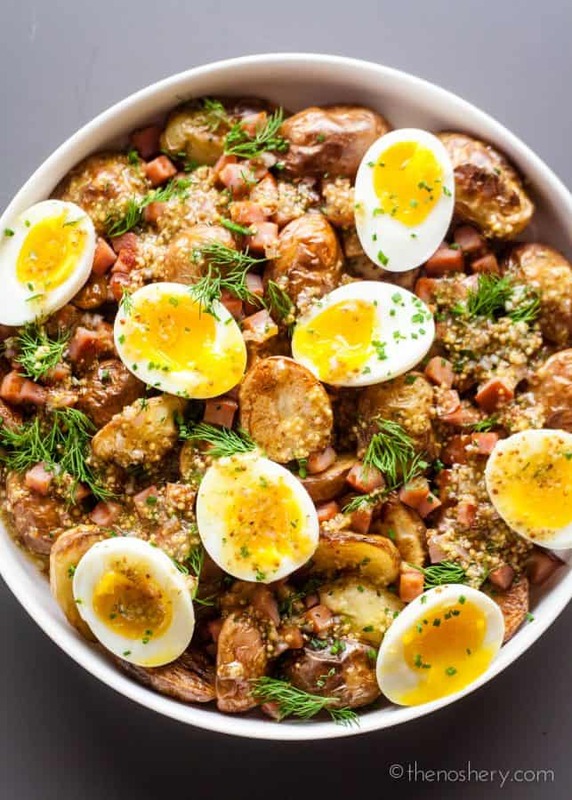 The roasted potatoes give this salad little more texture. Then they are then topped with diced smoked ham, soft boiled eggs, whole grain mustard vinaigrette, dill, and chives. Heat oven to 400? F.
Line a large sheet pan with foil. Spread potatoes in an even layer on sheet pan. Drizzle with olive oil and sprinkle with salt. Mix potatoes until evenly coated with olive oil. Roast potatoes in the oven for 45 minutes or until tender and golden brown. While potatoes roast, bring a pot of water to a rolling boil. Prepare an ice bath for the eggs. Gently lower eggs into the boiling water. Cover and boil for six and a half minutes. Using a slotted spoon transfer the eggs to the ice bath. Allow the eggs to sit in the ice bath for a minimum of 5 minutes. Then, peel eggs. Heat a skillet over medium-high heat. Spray the skillet lightly with cooking spray. Sauté diced Smithfield ham until lightly browned, about 5 minutes, and set aside. In a small bowl combine dressing ingredients. Whisk until dressing is emulsified. Spread roasted potatoes in a shallow bowl or platter. Sprinkle with ham. 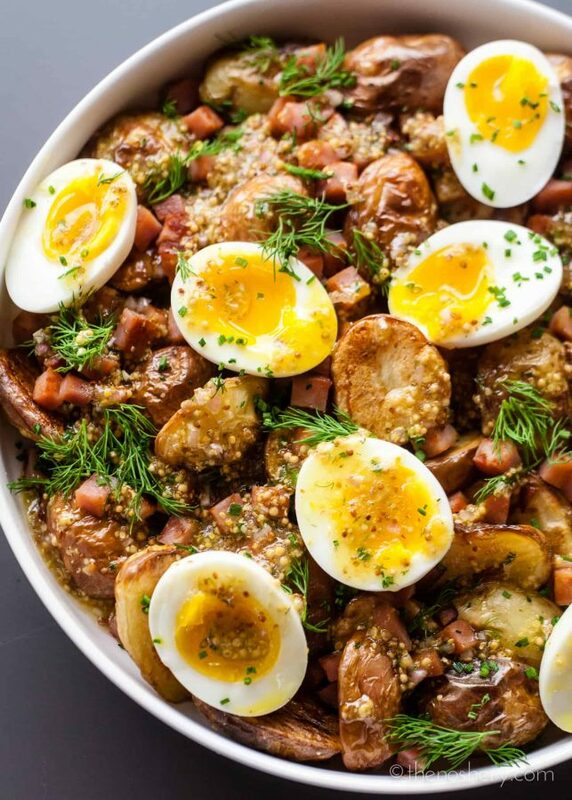 Cut egg in half and place on potatoes. Drizzle with dressing and garnish with fresh dill and chives.